Jingle Smells! Fab Festive Fragrances from pure essential oils. - Amphora Aromatics Ltd – Supplier of pure essential oils and aromatherapy Products. Jingle Smells! Fab Festive Fragrances from pure essential oils. Jingle Smells! Fab Festive Fragrances from Pure Essential Oils. Today – Clove & Pine. rather than man-made chemical synthetic fragrances. As it’s Friday and we’re feeling funky and festive, we thought we highlight TWO of the best Christmas oils today! Let’s start with Clove. 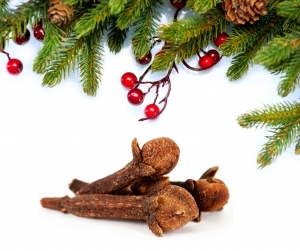 A popular spice used to flavor mulled wine, mince pies and other Christmas recipes during the festive season. Its scent has become closely associated with the festive times! Clove’s tradition in Christmas lies in its use as part of the pomander (the clove studded orange) which originally came about during the Middle Ages. It was believed that the scent from the pomander would help ward off disease during an era where the Black Death and other diseases were prominent. People would wear them around their necks (including Queen Elizabeth I) to help protect themselves from disease. As time went by, the pomander became a popular token of prosperity to be given and used as decorations during Christmas and New Year. It’s a lovely fragrance to fill your home with; the spicy scent offers warmth and protection against colds and viruses due to its anti-viral properties. Clove is a potent oil and should be used sparingly. Pine essential oil, extracted from the needles of the evergreen tree is another great Christmas oil. Evergreen trees were often celebrated during the winter solstice as they were one of the few trees to remain green all year round. These trees reminded people of the green plants and trees which would return once winter had passed and that the sun god would eventually be well again. The forest fresh scent of pine is uplifting and stimulating. It can help ward off colds and its refreshing scent will create a lovely, fresh atmosphere in your home. For those of you who have chosen the less messy option of having an artificial Christmas tree, you can still get that pine fresh aroma from the wonderful essential oil it produces. A room spray is a really good way of scenting a tree. Simply add 100ml of filtered water to an empty spray bottle and add 30 drops of the essential oil. Spritz this around the house and on the tree before the family arrive to give your home that festive feeling. Just be careful not to spray on to any fairy lights! Thank you for reading! Don't forget to check out out other blogs which include FREE tips and advice from our in-house Aromatherapist Eugeny Couture and our Beauty Therapist Sophie Rouse.